Perfect for mid-level players; a touch pricey for newbies. Decent, affordable ukes with great action and construction. Another £50 to £100 will get you a much better brand. Kahua, Kahuna, Kahana, Kala: it’s all too easy to confuse the many Hawaiian-sounding ukulele brands on the market, especially as we guitarists have an unfortunate tendency not to take ukes seriously. Thanks to gratuitous George Formby references like the one we made above, plus the simple fact that a lot of ukes are cheap junk that cost 20 quid and break after five minutes, the instrument is in need of an image upgrade. Well, you won’t be laughing when you pick up one of these three Kahuas. Although they’re made in China and have the same synthetic gut strings as the pink ukuleles that people buy for their toddlers, the quality of the engineering - plus the non-funny price-tags between £121.95 and £166.95 - means that these are ukes to take seriously. Kahua, owned by a company called IQ Plus Music in Thailand and distributed here by Active Music, has a couple of dozen ukulele variants on offer. These range from 21” to 26” in length - that’s the body plus the neck and headstock - and come in a variety of woods, from the cheap to the posh. The three we have here are a 21” Soprano (pictured above), a 24” Concert (pictured below), and a 26” Tenor. The largest and smallest are made of relatively expensive tonewoods, and cost noticeably more than the 24” model as a result. Let’s start with the KA-26 Tenor, a burl maple uke of serious aesthetic quality. Thanks to larger ukuleles’ ability to handle a DGBE tuning - in other words, the same as the highest four strings of your guitar - it’s a more familiar playing experience than the other two. You’ll go straight to D and D minor chords and be impressed with the bright, clean response from the strings, we reckon. With 16 accessible frets of the 20 on the rosewood fingerboard, there’s room for a fair bit of manoeuvre. Burl maple is known for its solidity and resonance - as well as its high cost - and it comes into its own on this ukulele. The volume alone reveals the importance of a decent timber in the body. By the instrument’s very nature, anything you play beyond the 12th fret will sound pretty much like the theme from Bagpuss, so the extra weight and presence supplied by the maple is welcome. The overall construction is impressive, as it should be for £160 plus change: we couldn’t find any gaps between the components and the action is satisfyingly low. The standard ukulele tuning is GCEA, but the KA-24 is able to handle that or the guitar tuning we used on its bigger brother, and as such it’s a decent midpoint between those two approaches. In fact, the 24” uke doesn’t differ radically from the 26” model in construction or design, with the same 16 accessible frets and hardware. The wood is admittedly much cheaper: tamo ash is perfectly usable, but it doesn’t exactly lend much to the instrument, tonally or visually. If that doesn’t matter to you - and it won’t, unless you have particularly keen ears and demand a woody, resonant tone - then this is the uke to go for, especially at a hefty £45 less than the burl maple equivalent. As for the fairly tiny KA-21, you can use the guitar tuning if you like but it’s really suited for the brighter, more fragile sound of GCEA - and as this instrument has only 14 frets and no more, even lacking inaccessible ones, you really need to take its less robust sound and feel into account. 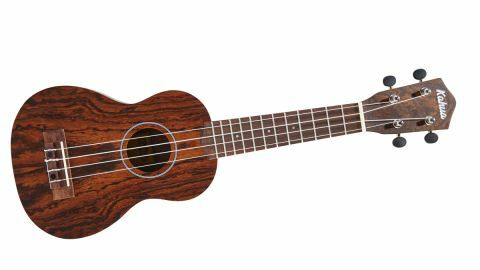 Of the three ukes, this model inevitably suffers most from a toy-like feel and a low volume, although performers who stand in front of a chest-height mic should have no real problems with the latter. Perhaps this uke should be regarded as a practice or backup instrument, despite its fairly luxurious bocote body. At £120-plus, you still wouldn’t want your drummer to step on it, of course: invest in a hard case if you plan to take it on the road. The crucial element of any ukulele, and the feature which makes an adequate uke into an excellent one, is the machine head quality. Tune any of these ukes up and you’ll need to retune it five minutes later: rest assured that this is reasonably commonplace in ‘new ukulele’ world. However, play your uke for a couple of weeks and the neck should (operative word: ‘should’) become accustomed to the string tension and settle down. The action might wander up and down too, in which case you’re out of luck because the bridge doesn’t have adjustable saddles. Still, over the course of our review these components seemed to be of perfectly reasonable quality, and if you keep your Kahua away from extremes of temperature (and it doesn’t get rained on), you’ll be fine. So far, so good. If you’re looking for a uke that will reward your playing with decent tone and reliability, invest in any of these instruments with confidence, although our taste definitely strays towards the two larger models. We love the sheer portability of these ukes: at only 405g, 498g and 572g respectively - about the weight of a nice cup of tea - you’re getting an instrument that is ridiculously easy to carry around, especially as they come with a soft case of decent quality. However, the point needs to be made that these ukes don’t have pickups, or any electronic components whatsoever. This bothers us for two reasons. Firstly, you’re paying quite a chunk for these instruments. Installing and wiring in a piezo pickup - under the bridge, for example - is not cheap, but it’s not heinously expensive either, and the cost of doing so could have been passed on to the customer in return for a much more usable instrument. Had these ukes possessed pickups, the player could have applied a huge range of effects to the signal - octavers in particular come to mind - in order to replicate a guitar or bass tone in live or studio performance. Secondly, in this day and age, there are several professional applications for the ukulele which would have been roundly mocked a couple of decades ago, the Ukulele Orchestra Of Great Britain being just one example. Ukes are well established as both studio and live instruments these days, so a pickup would have added serious value. For both of the reasons above, the ukulele market is fairly saturated with excellent instruments nowadays. A quick internet search reveals that Kala do an electro-acoustic tenor uke for around £170. For only another £50 to £100 on top of that, you’ll bag yourself an even more superior instrument. Admittedly, you’re then entering professional uke player territory, and only you know if you really need that much quality. Who’s going to play these Kahua ukes, then? Anyone who takes the instrument seriously enough to pay three figures for one, but who isn’t necessarily bothered about ease of amplification or tone-shaping.